The U.S. Air Force's top secret X-37B Space Plane made a not-so-secret return to Earth this morning, landing at Vandenberg Air Force Base in California after an impressive 674 days in orbit. What is known is that the X-37B has no human pilot, or at least not one in its windowless cockpit. It's operated remotely and lands on its own. The details of its launches aren't secret, but nor are they particularly interesting: it rode an Atlas V booster on Dec. 12, 2012, and assumed orbit about 180 miles above the Earth. That last part, notably, was figured out by a network of curious astronomers, not released publicly by the Air Force. The plane's size means there isn't room on board for much except avionics equipment, fuel for the thrusters, and a mysterious cavity about the size of a truck bed that could contain all manner of sensors, experiments, hardware — perhaps even a plant or some bacterial colonies. Of course, no one can be sure what's inside. 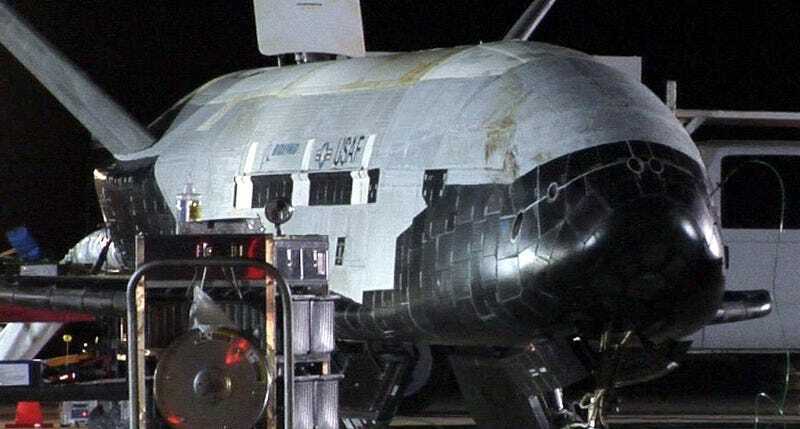 On the more speculative side, David Baker, editor of the British Planetary Society's Spaceflight magazine, has long assumed that X-37B's was a reconnaissance mission. "Space-to-space surveillance is a whole new ball game made possible by a finessed group of sensors and sensor suites," Baker told the BBC in 2012, and "we think the X-37B may be [using these] to maintain a close watch on China's nascent space station [Tiangong-1]." The X-37B is in a much lower inclination which means it can only see a very narrow band of latitudes, and the only thing that's of real interest in that band is the Middle East and Afghanistan. Is it spying on Tiangong-1? I really don't think so. I think the fact that their orbits intersect every now and again - that's just a co-incidence. If the US really wanted to observe Tiangong, it has enough assets to do that without using X-37B.